Houses and condos are not the only housing structures that have unique insurance needs. Owners of mobile homes (manufactured homes) face insurance claims unique to them. 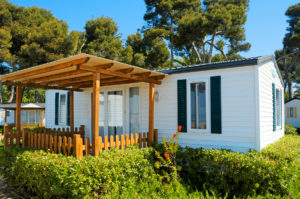 A traditional homeowner’s insurance policy may not fully cover the potential damages mobile home owners’ face; that is why we recommend a Mobile Home Insurance policy for anyone owning a mobile or manufactured home. Mobile home insurance not only covers your mobile home and your personal property, the policy can also cover detached structures like garages or sheds and attached structures like porches. A mobile home insurance policy, like a homeowner’s insurance policy, may also offer coverage for liability, should someone be injured in your home or on your property. Comprehensive: Providing protection against covered loss such as fire, wind, theft or other covered events. Replacement costs or Agreed Loss Coverage: Replacing your home less any deductibles. Reimbursements for accommodations resulting from a covered event while your home is being repaired. Call the agents at Alaska Service Agency in Anchorage, AK to get a quote for Mobile Home Insurance today! The experts at Alaska Service Agency can assist with creating a policy that fits your needs and budget. Ask your agent about discounts like New Mobile Home, Multi-Policy and Safety devices discount. There are many options for Mobile Home insurance out there and the knowledgeable staff in Anchorage, AK will help you find the best option for you! Alaska Service Agency was founded in 1980 and is locally owned. We are proud to be one of Alaska's largest insurance agencies and offer a complete line of both personal and commercial insurance products. With over 30 years of insurance experience we will find you the best price on the best insurance products available. Call one of our licensed insurance agents today. Our agency is committed to provide outstanding customer service and support, top of the line insurance products and expertise you can count on. Catering to your insurance needs is our focus. Let us know how we can help you. We look forward to earning your business. At Alaska Service Agency, we take customer satisfaction seriously. Please consider leaving us a review and tell us about your experience. If you feel that we could have done better, please feel free to call the agency and speak with a manager. We'll make it right. Just click a button below to leave a review.